Former FBI Director James Comey writes in his new book he expected Hillary Clinton to defeat Donald Trump in the 2016 election, saying he was "sorry" she was angry with him for his handling of her private email investigation. Clinton has consistently assigned blame to Comey for her loss, pointing to his October 28, 2016, letter to Congress announcing newly discovered emails related to her use of a private email server as secretary of state. She argues the letter stopped her momentum and gave Trump the leg up he needed to defeat her in November. According to the New York Times, Comey writes in A Higher Loyalty: Truth, Lies and Leadership that he feared he would make Clinton an "illegitimate" president if revelations came out later that he had concealed the new developments. 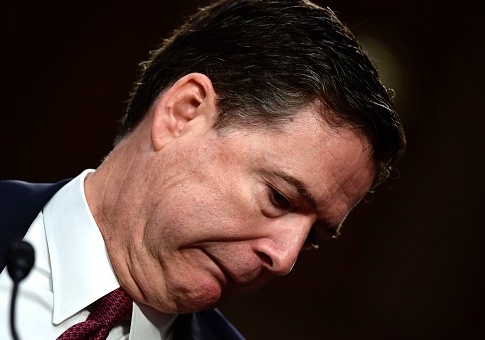 The book also serves as a platform for Mr. Comey to once again defend his handling of the Hillary Clinton email investigation and the decisions that for a time made him one of the most despised figures among political liberals and other supporters of Mrs. Clinton. However, Mr. Comey acknowledges that he thought Mrs. Clinton would win the presidency and said it is "entirely possible" that he decided to reveal that the email investigation had started up again 11 days before the election because he was primarily concerned that if he concealed the renewed investigation, it would make her an "illegitimate president." Would he have made a different decision if Mr. Trump had been ahead in the polls? "I don’t know," Mr. Comey concedes. The Washington Post reported Comey writes his wife and daughters voted for Clinton and addressed her "anger" toward him. "I have read she has felt anger toward me personally, and I’m sorry for that. I’m sorry that I couldn’t do a better job explaining to her and her supporters why I made the decisions I made," he writes. Comey's letter resulted in Democrats flipping in their previous praise of him, going from calling him a man of unimpeachable character to saying he was unfit for his position. Clinton said last year Comey "should have been disciplined" for his handling of her email probe, saying Trump fired him for the wrong reason. Comey has previously testified he felt "mildly nauseous" at the idea he could have swayed the 2016 electon. This entry was posted in Politics and tagged 2016 Election, Clinton Email Scandal, FBI, Hillary Clinton, James Comey. Bookmark the permalink.